Morecambe defender Sam Lavelle hopes he will be available as they kick off their League Two season at Crewe Alexandra on Saturday. The defender missed the Shrimps’ final pre-season friendly against Fleetwood Town last weekend thanks to an ankle injury. It leaves manager Jim Bentley sweating on the 21-year-old’s fitness with Steve Old the Shrimps’ only other senior centre-half. Lavelle said: “I’ve done my ankle – it is not too bad but my main target is getting fit for Saturday so I didn’t want to make it worse last weekend and go back to square one. Lavelle is hoping for a battle at the right end of the table this term after they just escaped the drop last year. He was part of the team who claimed the final-day goalless draw at Coventry City which kept them up on goal difference and relegated Barnet. With new owners and an overhauled squad, there is a feeling of positivity at the club. 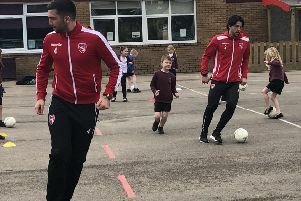 The hope is that the off-field boost can be reflected on the pitch, with last season’s League Two winners providing an example of what can be achieved. Lavelle said: “We are hoping to challenge at the other end of the table. “We are underdogs in the league, we have a low budget – everyone knows that – but the gaffer does a good job with the budget and I think we are good enough to be top half. “We were a bit unlucky to finish were we did last season but we stayed up and hopefully we can push up towards the play-offs. That’s our ambition.